Approx 2" drop x 1 1/2", on an adjustable leather cord. The tiger is regarded as the king of the beasts in the Orient and is a symbol of power. 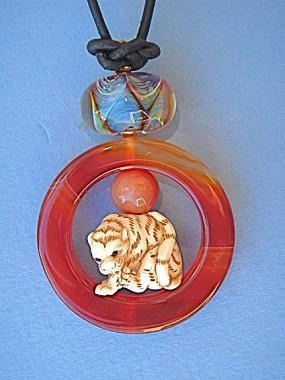 Valued as a charm, the tiger is believed to keep demons from entering the household and to ensure the safe return of the master of the household. The circle is the symbol of creation, immortality and eternity.